Why Bother Cleaning Your Attic? You may think that it doesn’t really matter if there’s an inch of dust, and who knows what else, up in your attic. You rarely go in there anyway, right? Unfortunately, even if this is the case, that dust can still cause a lot of trouble for you and your family. It can very easily enter the air of your home. This can be troubling for anyone who has a hard time breathing to begin with, such as those who suffer from asthma. Even the elderly and children can be negatively affected by polluted air. 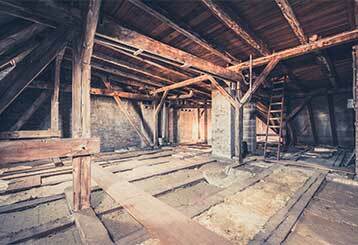 If there’s been a pest infestation in your attic, a cleaning is even more important. Even if they’re long gone, what they’ve left behind is still just as dangerous. Their waste can carry all kinds of bacteria, which can wind up on any items you may have stored up there. If there are any carcasses from the rodents, not only can that bring more disease, it can bring in bugs as well. No matter how you look at it, for the sake of the health of your family, it’s best to do something about it. Our experts have the best tools available to be able to clean out your attic safely, making sure that none of the dust or other contaminates escape into your home in the process. We’ll cover every nook and cranny, and be certain that everything is cleared out. Afterward, we can decontaminate the area with a sterilization spray, which will take care of any viruses or otherwise that might be hanging around. If any insulation was damaged due to pests, we can also replace it! That way, you don’t have to deal with finding another company to take care of it. Get your attic like new again, and protect your family’s health in the process by contacting Attic Cleaning San Jose now.